While many assume the Petit Basset Griffon is a canine that bodes a wire fur coat requiring much grooming, it actually is not. They have a thick fur coat that resembles a wire one, but they are very easy to care for. They are generally very pleasant dogs with natural scenting abilities. This breed loves to explore, trail and play with their families. These dogs blend in well with little ones, just about every type of other household pet and can be welcoming with strangers that do enter their homes. Keep in mind, they are diggers and will be prone to do so as well as barking from time to time. Very affectionate creatures with excellent watchdog capabilities. This breed is an energetic one, and they will need to exert themselves on a daily basis. This is not the type of dog that should reside with an older couple as owners as they will get into mischief if not given the proper time each day to run, walk or play outdoors. They will be at their highest potential and live a happy life if they can reside in a home that provides ample time spent both in and outdoors. Their fur coats will require grooming on a weekly schedule to rid it of dead hairs and debris. One great thing about owning a Petit Basset Griffon Vendeen is that they do not generally suffer from any major health concerns. They can develop CHD, PPM, otitis externa and few retinal and/or corneal conditions as well. In rare occasions they can also develop patellar luxation, epilepsy, overactive thyroid disorder, interverbral disk disease and meningitis. The vet may recommend screening for their eyesight and their hips as time progresses. The average lifespan for a Petit Basset Griffon is between eleven and fourteen years long. They generally weigh anywhere from twenty five to thirty five pounds when they are fully grown dogs. Dating back to the sixteenth century in Europe, the Petit Basset Griffon Vendeen obtained its name from being a canine that was low to the ground. The Vendeen portion of their name was derived simply from where they were discovered in Vendeen, France. The town of Vendeen is well known for its rugged terrain, making it not an ideal place for just any old canine to hunt and climb through. The Petit Basset was just the trailing dog that could handle these types of hunting textures to be an excellent choice for a companion dog for all hunters. In the eighteenth century, the Petit Basset became a popular choice for being a show dog in the United Kingdom. It has continued to be a dog that is bred all over France well into the middle of the 1900's. 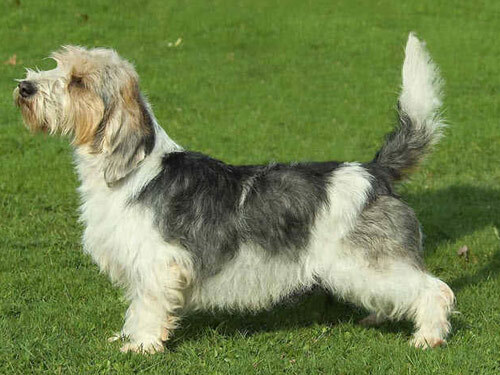 It also goes by the name of Little Griffon Vendeen Basset as well. The breed finally got their recognition by the AKC in the late 1900's around 1990.